Happy Friday friends! 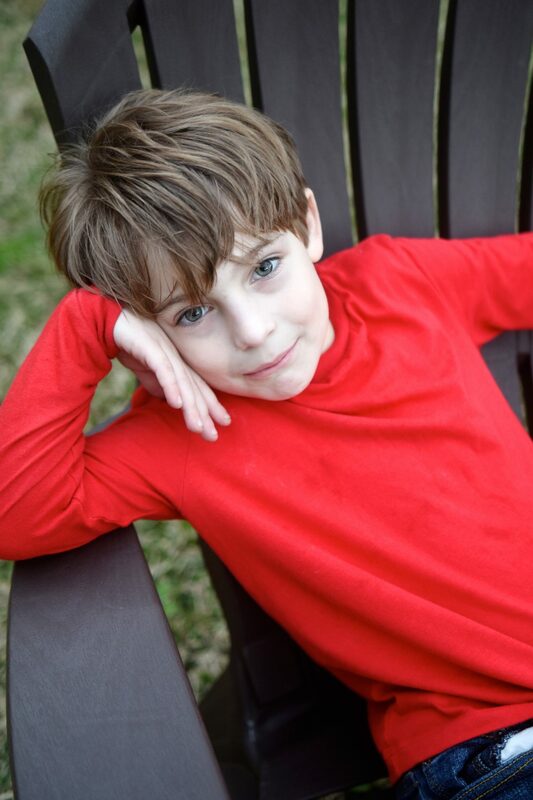 It’s our first weekend in March and our sweet James’ 8th birthday on Sunday! As much as it surprises me, I’ve never been the “I wish they could stay babies forever” type. Each stage with James has been better than the last and he’s been the most delightful person since Day 1! He’s got the kindest heart, is dangerously smart, and super funny too. Not to mention, he’s a great big brother! We just love him to pieces! We’ll be celebrating his birthday with a football party at our local park on Sunday morning. I’m so thankful for a low-key party- all we need is donuts, coffee and cake! I’ve been browsing the stores online and getting all excited for the new Spring styles. Our weather is starting to warm up, but we’re still getting loads of rain. Hopefully, we’ll be seeing more sunshine soon! 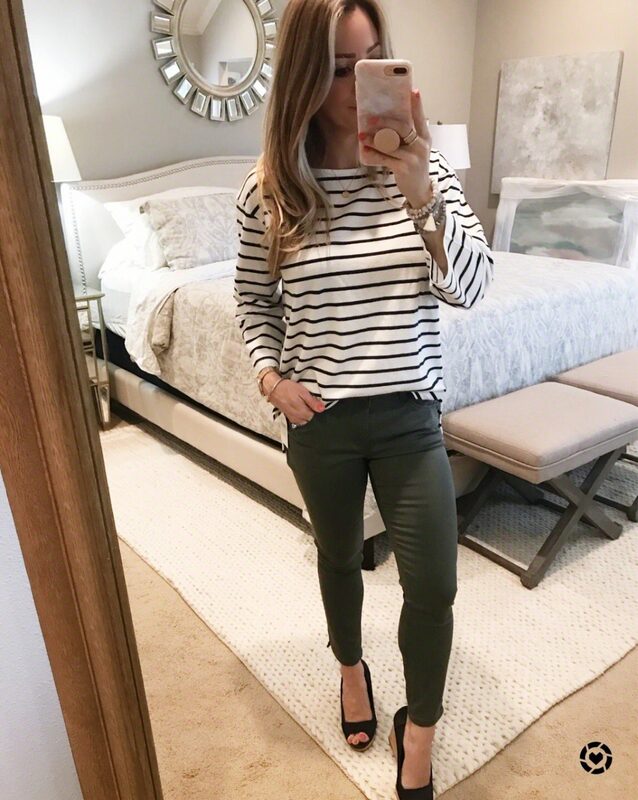 I was bummed last week when I shared 6 Must Have Tops – the cargos I was wearing were old and the closest I could find were this pair. 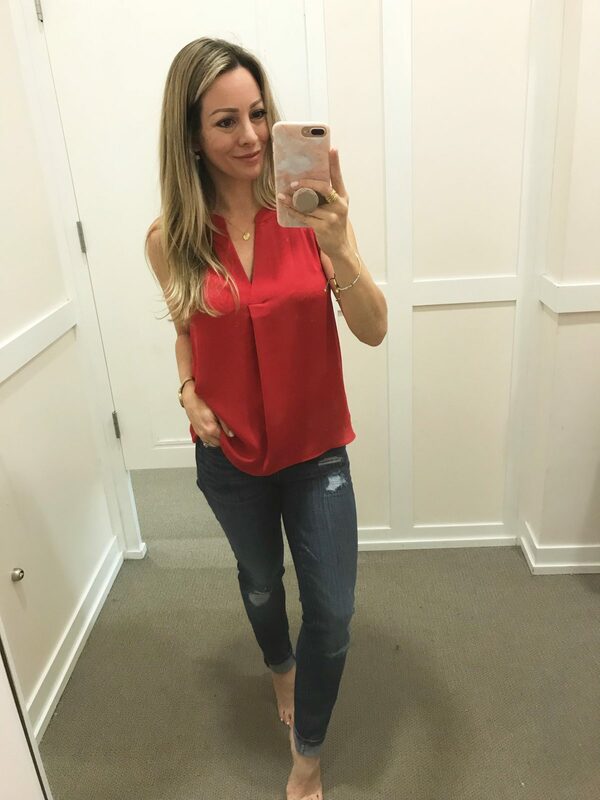 Now, I’ve found a great pair of skinny crop jeans that are equally as darling and easy to wear! They have “absolution technology” that holds you in and “boosts your assets.” They are perfect to throw on for weekends, but can also be dressed up with heels. Sizing: Because these jeans come in petite, they are a true crop and don’t need to be altered. They are mid-rise with pockets in front and back. Fit TTS. Top is super cute, but I would probably size down to XXS for a more slim fit. This frayed hem jean is soft and stretchy with a nice, light wash and only a slight bit of distressing. I’d probably cut them about half an inch and fray them just to make them a little more ankle length on me. Otherwise, they fit TTS. The bell sleeve top is darling with the ruffle sleeve and the unique texture. I thought the shirt would be too wide, but I really like the loose, swing fit! Ooh mama, it looks like a miniskirt, but it’s actually a skort with pockets!! The embroidered floral pattern is bold and I wish it photographed better at my house. Even though it’s on the short side, because it’s actually shorts in the back, I didn’t feel too exposed. If you’ve been working on your legs – here’s a great opportunity to show them off!! Although this bag is too big for me, it might be perfect for you! 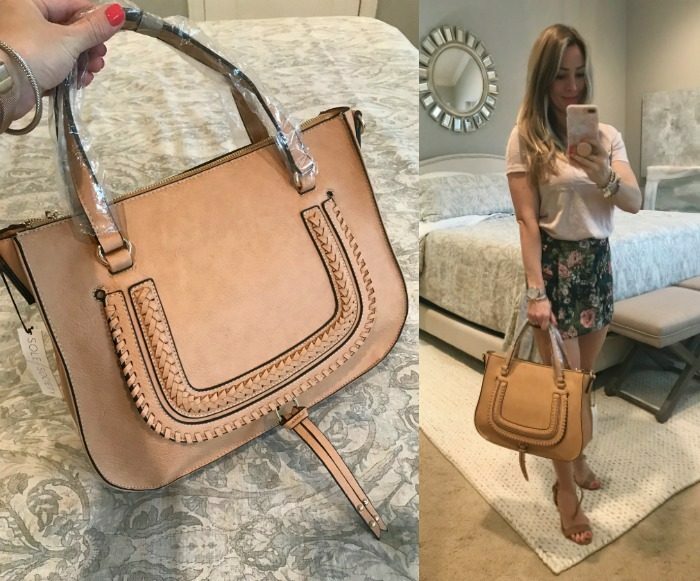 It’s high quality, has great pockets and a is a great dupe for the expensive Chloe! It comes in two other gorgeous shades- a blush pink and pale blue, both of which you can’t go wrong with for Spring! I would definitely have kept this bag if it were a tad smaller! Now that our weather is starting to heat up again, I’m on the hunt for a good running or workout shorts. This pair is silky smooth and lightweight, with a wide comfortable waistband that ties with a drawstring. You can cuff the shorts up to be shorter or undo them for a longer look. For all you ladies requesting more work-wear options, I hear you and I’m on the lookout! 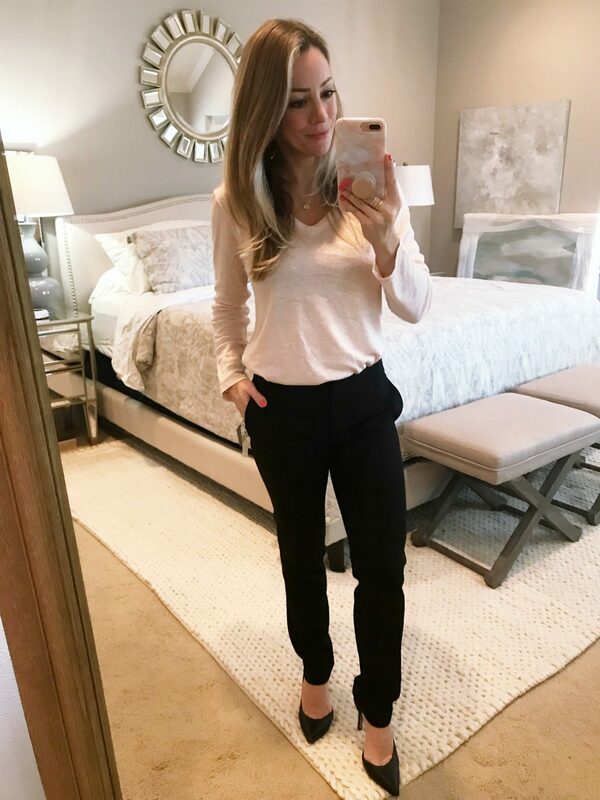 A great black pant is a working woman’s staple/workhorse item. This skinny pant is a great option with a nice weight for transitioning to Spring. I would get the pockets stitched closed so they don’t flair out. They fit TTS, and are slim fitted through the hips and thighs. I found a couple sweaters that are Spring friendly with their pastel color. The marbled look of this one got me and I’m actually in love with these distressed jeans. The distressed jeans fit comfortably in all the right places with no gaping in the back. I like the wash and little bit of distressing that isn’t over the top. These came home with me and I’ve already worn them several times! I usually get petite at Loft, but I liked how comfortable the regular fit in this pair and I can cuff them at the bottom. 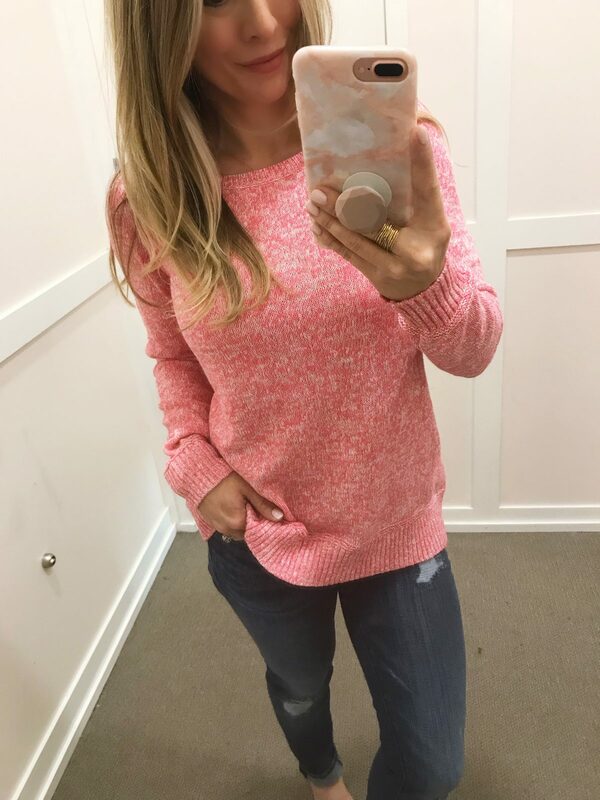 Isn’t this pastel sweater pretty?! It would also look great with your white jeans and a tan bootie or with jean shorts on a chilly summer night. Here are the winning white jeans from my review last week! I can never pass up a good shell tank because they are so versatile and flattering. You can wear them alone with jeans and heels for a date night, under a cardigan or blazer at work, tucked into a skirt, or with cotton shorts in the summer. This one is silky smooth in the front and soft t-shirt material in the back. I love the vibrant red too! 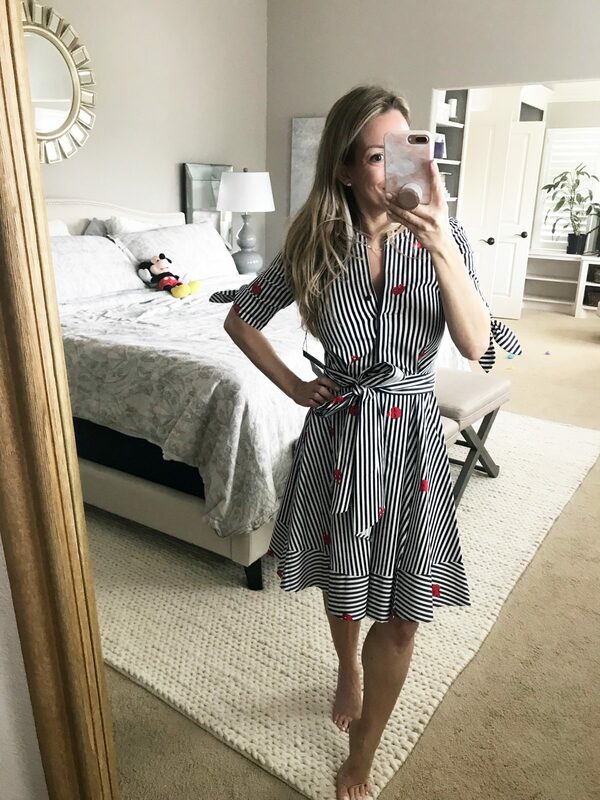 This sweet dress can be worn on the shoulder for work or off the shoulder for a night out. It’s more navy than black in person, which I like! Oh no! I wanted to love this dress, but it’s way too big for a petite gal. 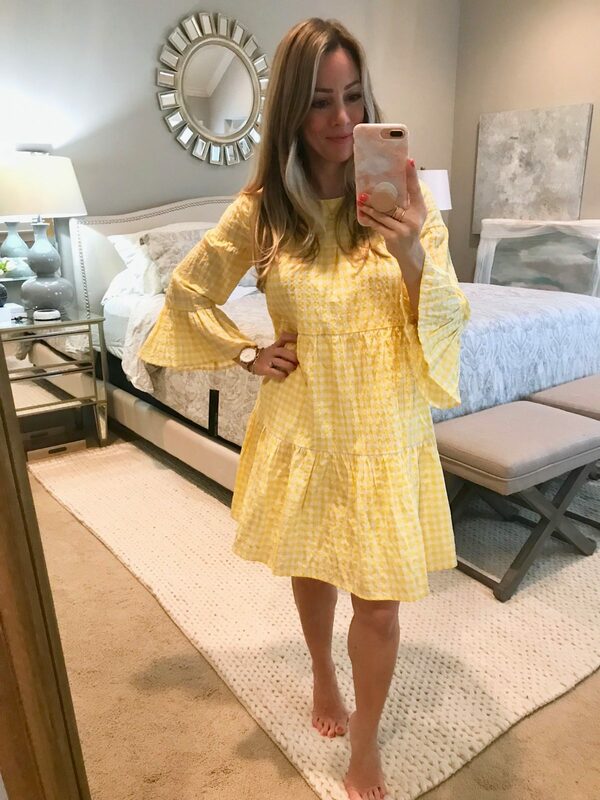 It’s still worth showing because the yellow gingham and swing shape is so cheerful for Spring. It’s fully lined and the bell sleeves are the bracelet length. If you aren’t super petite, this might be so cute on you! It’s definitely easy to wear! How great would this shirt dress be with with white sneakers on the weekend for running around?! And you could add your jean jacket if it’s chilly. Or you could dress it up with a wedge for a fun, casual night out. The dress is quite stretchy and I dig the nautical feel. Don’t worry about the white part, the dress is completely opaque. 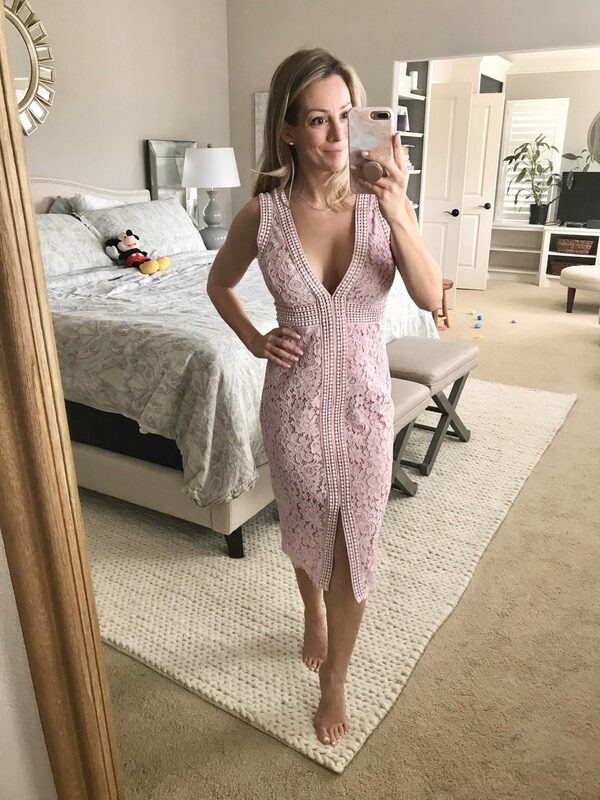 If you’re looking for your next Spring soiree dress or something for a Spring wedding, this is for you! It’s a beautiful shade of lilac/pink and absolutely stunning in person. Although the front has a deep v-cut, you can still wear a bra with it and it’s fully lined. I love the loose hem at the bottom and the charming v-cut in the back. If you’re headed to a derby party this Spring, I could totally see this with a huge hat!! So cute online, so cute on the hanger, and SO cute on! How fun are the navy and white stripes and the winking apples?! The stripe pattern kind of ruffles and changes directions at the bottom. Because of the classic shape, this dress will fit many occasions from the office, a shower or party. Try pairing it with red strappy heels for a pop of red! #givemeallthegingham This asymmetrical wrap dress is the perfect mix of sassy and sweet! If you want a lil less sass, a bandeau top would be cute underneath! It’s weird though that online it looks like it has short shoulders, but the dress I received is tank style! I still love it though! My picks: The Barefoot Dreams short robe is 50% off and comes in 6 colors. AG ‘the legging ankle’ jean is 20% off and fully stocked in all sizes. Fit TTS. LOFT • 40% off tops and sweaters. My picks: Of course I love this striped tie cuff sweater, but it’s lightweight so great for now into Spring. Don’t forget, LOFT now has PLUS SIZES! ANTHROPOLOGIE • FREE shipping on all orders. My picks: I adore this grey/white striped boatneck tunic & they have a huge selection of darling swimsuits! MADEWELL • Free shipping & returns for insiders. My picks: This gingham tie front top is now under $50. 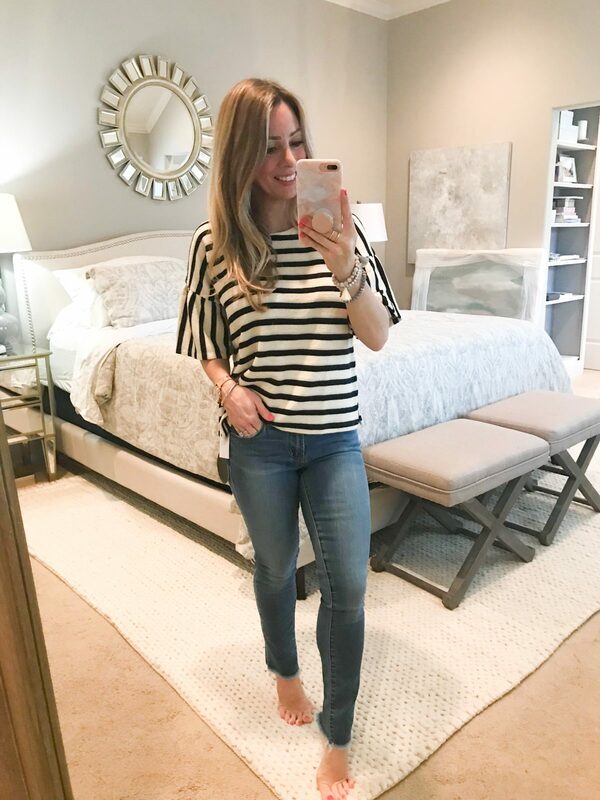 My picks: This striped short sleeve button up is versatile for work or play & the classic striped boatneck top is 30% off. OLD NAVY • Up to 50% off all jeans. Have a great weekend friends! See you back here on Monday with Part 1 of our Spring Home Tour! I love that Chloe dupe! I don’t need another bag but if I did… 😉 Happy birthday to James! My mom always said the same thing about loving each stage we were in rather than wishing she could go back. I love that sentiment. Loving all the dresses you found and how fun is that skort?! Ready for Spring clothes over here! So many cute pieces! 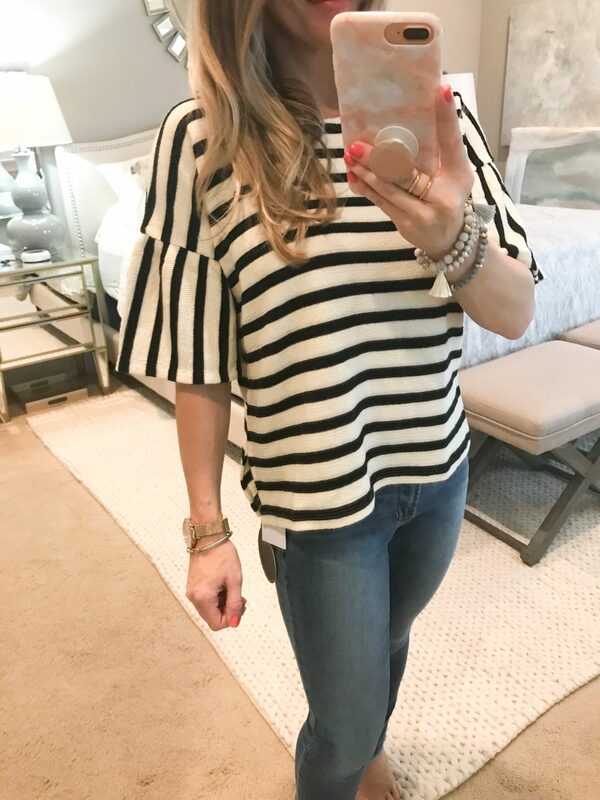 I am all about the striped tops and jeans! I feel like I LIVE in Stripes and jeans lately! It’s my fave right now!! Do you feel like horizontal stripes make you look wider? I have a D chest and although I love stripes and buy them often I tend to feel as if my chest looks bigger? Hi Kim! I don’t necessarily think horizontal stripes make my chest look bigger, but I pay more attention to the material. If a shirt is very clingy and form fitted, then it will definitely highlight the bigger chest and smaller waist.